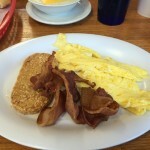 I have driven by this place about a million times on my way to West Marine and never thought to try it out, that is until I had some friends mentioned that they had a really enjoyable breakfast there. 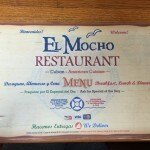 Today, my friends Pam and Tommy joined me at El Mocho Restaurant for breakfast. This is a true locals place; we saw several people that we knew enjoying breakfast at this Cuban greasy spoon. It was very busy; however, we did not have to wait for a table. We were able to seat ourselves immediately, and we were brought menus (which are in both Spanish and English) shortly afterwards. El Mocho Restaurant eggs, bacon and hash-browns breakfast. We ordered cafe con leche to start. One just has to order Cuban coffee at a Cuban restaurant! I ordered the special breakfast which costs less than five dollars and consists of two eggs, ham or bacon, and hash browns or grits. Pam ordered a breakfast sandwich on Cuban bread. And Tommy ordered the pancakes with eggs and sausage. It did not take too long for our food to be brought out to us. The bacon and eggs were good. I was disappointed with the McDonald’s like hash browns, so I ended up getting a bowl of cheesy grits too. The grits were a little runny, but they were loaded with butter and tasted delicious. 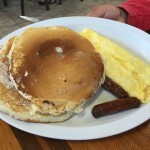 Pancakes, eggs and sausage breakfast at El Mocho Restaurant on Stock Island, Florida. The sandwich was a little bland, so Pam ended up lacing it with tons of hot sauce to pep it up. She was also disappointed that the hash browns were not as expected, so she also ordered the cheesy grits. Tommy’s pancakes were very heavy but delicious, especially after he drowned them in syrup (yum!). And again, the eggs and sausage were good. The atmosphere is very low key. And the service was very, very slow. At least we were entertained by watching the televisions hanging around the room while waiting so the check and a to go bag. Also, I was annoyed by the seating; I love booth seating, but the seat moved around every time the person sitting on the other side moves. For the three of us, breakfast was less than $30, plus tip of course. We all decided that the food was good enough and cheap enough to come back in the future for breakfast. Plus, they are conveniently located on Stock Island very close to my office. They also serve breakfast and dinner.